Scoring a deal with a publishing house can sometimes seem impossible—at the very least fantastical—even if you’ve made it happen before. Even though I’ve written several books, I’m still surprised that any of them made it to the shelves. Happenstance and luck always seem to play a role. My first effort, Dave Matthews Band: Music for the People, came about when a writer friend managed to sell a similarly styled biography on Oasis. I kept badgering him over gin and tonics until he introduced me to his agent and walked me through the process. A short while later, I found myself cashing an advance check. Basically, I starred in a publishing fairytale. When that book sold well, the publisher called me to find out what music icon I wanted to tackle next. I narrowed down my options to this new little band called the Foo Fighters, and Beck, who was alt-rock’s golden child. Unfortunately, I chose the “Loser” singer. As I toiled away on my book, he proceeded to release increasingly experimental albums that sold progressively fewer copies. Meanwhile, the Foos became the biggest band in the world. Beck: The Art of Mutation sank like its namesake’s career and my publisher stopped calling. My career as a writer was stalled. More than half a decade passed and I couldn’t come up with an idea that would stick to the wall. I still had an agent, but only technically. The only time we communicated was when he emailed to ensure that my royalty checks for the DMB book were going to the right address. It wasn’t a bad relationship; it just wasn’t one that productively moved my career forward. After more than a few false starts, I started asking myself a simple question: What did I love so much that I would want to spend a year researching it and writing about it? My epiphany came as I was reading an old Calvin and Hobbes comic strip. The quirky adventures of the boy and his tiger got me to thinking: What the hell ever happened to their creator, Bill Watterson? After some quick research (ie. Googling), I realized Watterson was a true enigma. I drew up a one-page proposal in the hopes that someone would pay me to uncover the mystery. I shared the concept with my agent, but he wasn’t interested. I was convinced it was a good idea, but I wasn’t sure how I was going to get it off the ground without representation. Around that time, I happened to be talking to an editor at Continuum Publishing about their 33 1/3 series, which focuses on esoteric and forgotten albums. He passed on my idea to do a book on Marvin Gaye’s What’s Going On, but I decided to send him my proposal for my dream project on Bill Watterson anyway. He liked it and asked for a quick chapter outline. Soon enough, he was sending me a contract for what became Looking for Calvin and Hobbes: The Unconventional Story of Bill Watterson and His Revolutionary Comic Strip. Since my agent hadn’t been supportive of the idea, I decided to represent myself (with a little help from a friendly lawyer who looked over the paperwork). It all happened so fast that I had little time to consider my good fortune. Nevin Martell has been writing about food and culture for more than a decade and a half. 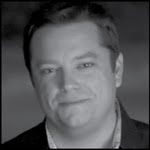 His work has appeared in The Washington Post Express, DC Modern Luxury, Capitol File, Washington City Paper, Cheese Connoisseur, Restaurant Management, Men’s Health, and online at The Washington Post’s All You Can Eat blog. His books include Looking for Calvin and Hobbes: The Unconventional Story of Bill Watterson and His Revolutionary Comic Strip, Standing Small: A Celebration of 30 Years of the LEGO Minifigure, Dave Matthews Band: Music for the People, and Beck: The Art of Mutation. You can find him online at nevinmartell.com. The Hancock, MD, Arts Council is sponsoring a Write Poetry Workshop on May 5 and 6, 2012 in honor of poet Ann Knox, a long-time member of the Arts Council and Writer’s Center workshop leader who died last spring. Funds have been contributed in her honor to support the workshop, and participants will pay only $15.00 for both afternoons. 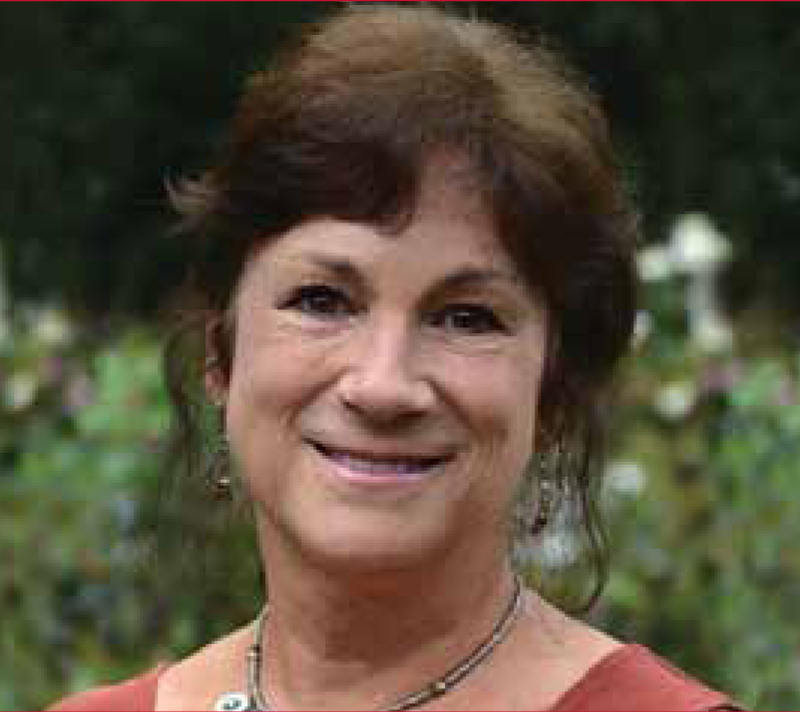 The workshop, which meets from 1:30 to 4:30 pm at the Hancock Community Center, will be led by Writer’s Center workshop leader Nan Fry. Dr. Fry, who received her Ph.D from Yale University, is the author of two books of poetry: Relearning the Dark and Say What I Am Called. Her work has appeared in numerous journals, anthologies, and textbooks. She received an EdPress Award for excellence in educational journalism and taught at the Corcoran College of Art + Design for over 20 years. Participants can expect lively sessions in which Dr. Fry guides them in exercises in which their imaginations can be loosened to shape words into poems. On Sunday afternoon, at the end of the workshop, participants will read their poetry and Dr. Fry will share a few of her poems. Several of Ann Knox’s poems will also be shared. To register, call Jeanne Ward at 717-294-3912 or email her at baumward@hotmail.com. 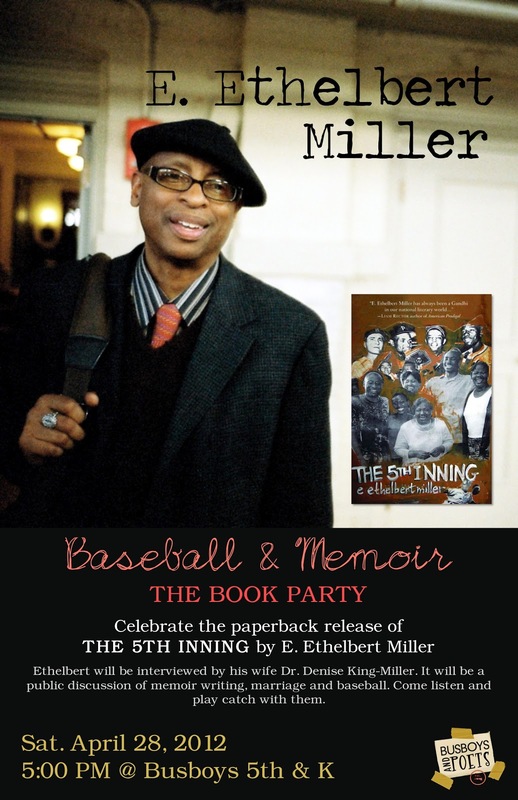 E. Ethelbert Miller reads from his second memoir, The Fifth Inning, now out in paperback from PM Press. 5 p.m. Saturday, April 28 at Busboys & Poets, 5th and K Streets, NW. Ethelbert will be interviewed by his wife, Dr. Denise King-Miller, in a discussion of memoir writing, marriage, and baseball. Come listen and play catch with them. Though he wasn’t there at The Writer’s Center’s (TWC) founding, Sunil Freeman has been with the organization longer than any other staff member—26 years! He is often described as TWC’s “institutional memory.” Hard working, modest, and giving, Sunil is perhaps the quintessence of TWC. in 1978. While there, he majored in journalism and wrote for The Diamondback, the university’s newspaper. He started taking workshops at TWC in 1985 and was hired in 1986. Sunil’s publications include two books of poems, Surreal Freedom Blues (1999) and That Would Explain the Violinist (1993), and numerous poems, essays, and reviews in various literary journals. It’s hard to tease Sunil and TWC apart. While talking to him, you learn that an important part of his character is the sense of accomplishment he gets from helping lead this well-oiled organization. He is particularly proud of inviting Stanley Plumly and Robert Bausch to lead workshops. This profile was originally published in the summer 2012 Workshop & Event Guide. Jason DeYoung is a former Writer’s Center staff member and Managing Editor of Poet Lore. 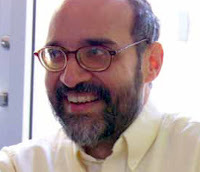 His fiction has appeared most recently in The Los Angeles Review, The Fiddleback, New Orleans Review, and Harpur Palate. His fiction will also appear in the forthcoming 2012 edition of The Best American Mystery Stories. He lives in Atlanta, Georgia. Writer's Center workshops have played a big role for winners of Amazon book competitions. Novelist Patricia McArdle recently gave a fascinating slide presentation at an Open Door reading in which she noted that Tammy Greenwood's Revising Your Novel workshop was very helpful as she wrote Farishta, a novel based on her experiences in Afghanistan. Farishta went on to win the the 2010 Amazon Breakthrough Novel in the general fiction category. Now we have good news from Jennifer Handford. Jennifer took a workshop with Barbara Esstman, and went on to be one of three first place winners of the Amazon Breakthrough Novel Award competition. Her novel, Daughters for a Time, is due for an April 24 release, and can be pre-ordered from Amazon now. It must have been a good twelve years ago when I first signed up for a workshop at The Writer’s Center. At the time, my husband and I were trying to start a family and were failing miserably at it. As a depression seeped into my bones, my husband tried to cheer me up by suggesting that we take up hobbies. He signed up for cooking classes with Roberto Donna and I signed up for a novel workshop with Barbara Esstman. Until we could work out our baby-making problems, we’d immerse ourselves in things we loved. In Barbara Esstman’s workshop, each participant was required to provide a chapter to be shared with the group. The participants were charged with reading a few of the chapters each week. In our sessions, we would critique the work we had read. When it was my week to have my work reviewed, I was filled with a bit of anxiety but mostly with excitement. I kind of liked my chapter and I thought that it would receive praise. But it didn’t. Some readers were confused, others gave suggestions, and some just said nothing. Quickly we moved on to the next participant’s chapter. Her chapter, they loved! Her chapter, made them laugh and cry! Her chapter, they commented, was reminiscent of Ann Tyler! I drove home that evening in a slump because Ann Tyler was my idol and if there was anyone who wanted to be compared to her it was me. Years passed and my children finally came: three daughters. In bits and pieces, I continued to write—a chapter here, a chapter there. Plot outlines were written and crumpled and thrown away. Character sketches and timelines were done and re-done. In 2010, with a just-barely completed manuscript, I entered the Amazon Breakthrough Novel Award contest. In June of the following year it was announced that I had been awarded one of three first place prizes. When I was offered publication, the editor noted that my work reminded him of an early Ann Tyler. More than a decade after my first workshop, my writing was finally praiseworthy. We were sorry to learn of the passing of Reed Whittemore April 6. Reed served twice as Poetry Consultant to the Library of Congress, edited the influential magazine Furioso, published several collections of poetry and nonfiction, and taught for several years at The University of Maryland. He was a beloved member of the literary community. We were fortunate to have him lead poetry workshops at The Writer's Center, and also to work closely with him in the production of the journal Delos. In 2007 Dryad Press published Reed Whittemore's memoir: Against the Grain: The Literary Life of Poet. In the foreword, Garrison Keillor noted: "Reed Whittemore owns the only sort of immortality that matters to a writer which is to have written things that people remember years later." A memorial service will be held this Thursday, April 12, 3 p.m., at Our Lady of Victory Catholic Church, 4835 MacArthur Blvd, N.W., Washington, DC 20007. Jody Bolz was three years old when she dictated a poem to her grandmother, a Russian Jew with limited English. The result was incomprehensible, but one thing became clear: Jody was a poet. It took her nearly two decades to fully unpack that sentiment, but she came away with an important assessment of the craft that consumed her: Poetry is a way of paying back the world for the gift of noticing. Having worked with Jody and experienced both the mentor and the editor, I’ve seen her talent for noticing, for paying attention, and the ways she’s chosen to thank the world for her gifts, leaving the rest of us richer for knowing her. My favorite part of working with Jody on Poet Lore was sharing in the detailed conversations between her and our poets. Yes, in a move seldom made by today’s beleaguered editors, Jody remains one of the few who take the time to write to her poets. The journal’s history (it is the nation’s oldest continuously published poetry journal) and reputation (beloved by those who know it) are draws to poets and readers—but Jody’s sensibility reveals the reason poets love Poet Lore. Jody came aboard with 24 years of teaching under her belt and a strong editing background. But beyond her talent for spotting printer errors and grammatical inconsistencies, Jody is a poet, and she and E. Ethelbert Miller (poet and literary activist) have kept Poet Lore a poet’s journal. Jody explains, “One of the things that I feel best about is engaging poets in a serious conversation about their work. It can salvage a poem.” And the attention does not go unremarked. Grateful poets speak of the time Jody took to deeply evaluate and consider their work. Someone was paying attention. And she loves the work. “The older I’ve gotten, the more I’ve felt that poetry is essential,” Jody says. “Poets leave behind a record of humanness—what it’s like to be alive here and now—an intense connection with a stranger in another time and space.” That’s what she looks for when reading a poem, and when she writes her own: work that lasts and that changes your way of thinking. Poet Lore's 123rd birthday—and National Poetry Month—will be celebrated with a reading at The Writer's Center on Saturday, April 21 at 2:00 P.M. Join Jody, John Bargowski and Mary-Sherman Willis (both featured in the Spring/Summer 2012 issue) for an afternoon of readings, champagne, and cake! This profile was originally posted in the summer 2012 issue of The Workshop & Event Guide. Caitlin Cushman is a writer/editor at Boston University. She holds a fiction B.F.A. from Emerson College and M.F.A. from American University. She spent seven years at TWC, at one time simultaneously teaching at AU, finishing her thesis, and working both as managing editor of Poet Lore and business and operations coordinator; she’s thrilled to have just one job right now. Her fiction has appeared in So to Speak and Amazing Graces, and she has written for First Person Plural. She loves Shirley Temples and Twain. We're looking forward to the April 10 reading by Kyle Dargan, Gregory Pardlo, and A.B. 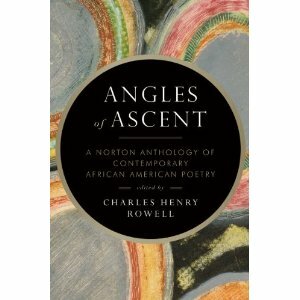 Spellman, poets who will be published in the forthcoming Angles of Ascent: A W.W. Norton Anthology of Contemporary African American Poetry. The reading takes place 7:30 p.m. Tuesday, April 10 at The Writer’s Center, and will be followed by a reception and book signing. General admission is $5.00 (free to members and full-time students.) This is the inaugural reading of the Politics & Prose at The Writer’s Center poetry series. We will announce additional readings as they are scheduled. For more information call The Writer’s Center at 301-654-8664 or Politics & Prose at 202-364-1919. Kyle Dargan is author of three collections of poems, Logorrhea Dementia: A Self-Diagnosis (University of Georgia Press, 2010), Bouquet of Hungers (University of Georgia Press, 2007) and The Listening (University of Georgia Press, 2004), winner of the Cave Canem Prize. His poems have also appeared in Ploughshares, Shenandoah, Denver Quarterly, Poet Lore, Callaloo, and other journals. He is an assistant professor of literature at American University and editor of Post No Ills Magazine (online), which he founded in 2008. In 2008, he won the Hurston-Wright Legacy Award for Poetry, and he was selected as the 2007 Drew Darrow Memorial Reader at Bucknell University. Gregory Pardlo is an associate editor of Callaloo, graduated from Rutgers University (1999) and received the MFA in poetry from New York University in 2001. He is author of Totem (APR, Copper Canyon, 2007), winner of the APR/Honickman First Book Prize; and translator of Pencil of Rays and Spiked Mace: Selected Poems of Niels Lyngsoe (Toronto: BookThug, 2005). Pardllo is Assistant Professor of Creative Writing at George Washington University in Washington, DC. A. B. Spellman is author of The Beautiful Days (Poets Press, 1965), Things I Must Have Known (Coffee House Press, 2008), Four Lives in the Bee-Bop Business (Pantheon Books, 1966), other editions under the title of Four Jazz Lives (University of Michigan Press) and Art Tatum: A Critical Biography (a chapbook). He has taught at Rutgers University, Morehouse College, Harvard University, and other institutions. 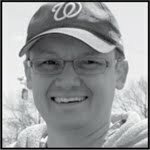 He also worked for several years for the National Endowment for the Arts, where he served in various positions such as director of the Arts in Education Study Project, director of the Arts Endowment Expansion Program, and deputy chairman for the Office of Guidelines, Panel, and Council Operations. Growing up in a racially divided town, Heidi Durrow would often describe herself as “black and white” to satisfy her curious community. 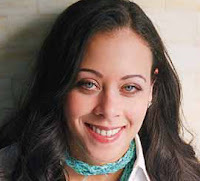 Issues of race, class, and social injustice would later inspire her novel The Girl Who Fell from the Sky the first recipient of TWC’s McLaughlin-Stearns-Esstman Prize, which awards the author of the best first novel published during a given calendar year. Your novel, The Girl Who Fell from the Sky, was recently awarded with TWC’s first-ever First Novel Prize. Pardon the pun, but how did you fall into writing? I always wanted to be a writer. But also wanted to be financially secure because I grew up without a lot of money. I took jobs that allowed me to write for pay: Hallmark greeting card writer, journalist, lawyer. Ultimately, I realized that I wouldn’t feel fulfilled if I never gave novel writing a shot. I quit my job as a corporate attorney and started working on this book. It took a long time—12 years—to write it and get it published. It felt like a miracle when I found out I had won the Bellwether Prize and would finally see my book in print. Where did you get your inspiration for The Girl Who Fell from the Sky? The story is inspired by a real event in which a family died in a terrible tragedy and the girl survived. I became obsessed with the girl. I wanted to know what her survival would look like and I set out to write a future for her, to give her a voice. I learned after some trial and error that the girl survivor had some relation to my own story. I went on from there, blending the initial idea with the touchstones of my own emotional experience. At The Writer’s Center, we provide writing workshops for all levels of writers. While you were writing your novel, did you workshop your progress? How did that feedback help your process? I did try to workshop some of what ended up becoming the novel. But I think I tried to workshop it too soon in one instance. In one summer intensive workshop, I got to share three chapters of the novel. It was there that I found a trusted reader who gave me great notes on other drafts. What’s the best advice you can give to our members working on creative pieces that also address issues of race, class, and social justice? 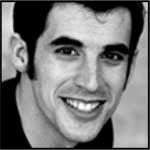 Heidi Durrow will read from The Girl Who Fell from the Sky, at The Writer's Center on Thursday, April 12, 7:00 P.M.
Zachary Fernebok is a playwright, a company member of Infinite Stage Theatre Company and Flying V, and playwright-in-residence at American Ensemble Theatre. His plays have been performed at The National Portrait Gallery and the Otono Azul play festival in Argentina among others. His plays, The Pirate Laureate of Port Town and Navigating Turbulence, will be read and performed this summer with American Ensemble Theatre. He teaches at Writopia Lab.